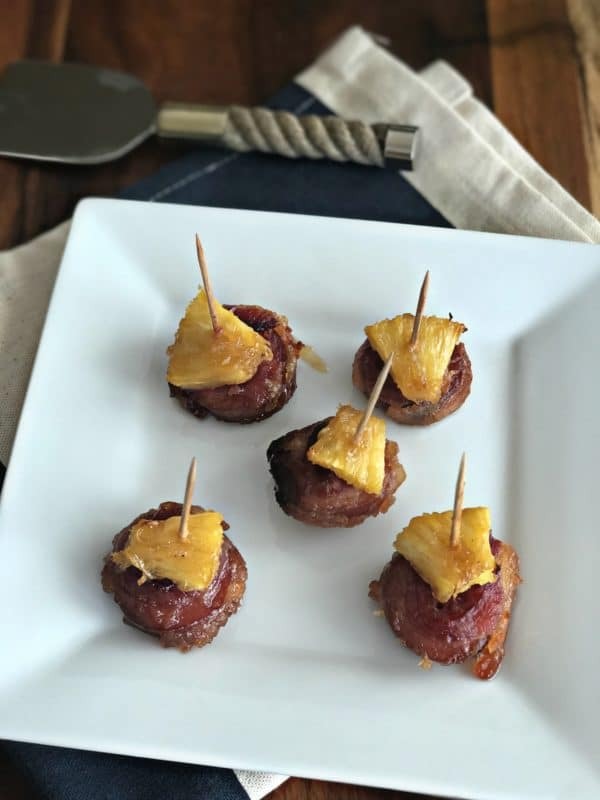 Bite sized pieces of sausage, wrapped in bacon, topped with fresh pineapple and brown sugar – baked into a perfect little appetizer that just begs to be eaten. This post has been sponsored by Farmland and Mom It Forward Influencer Network, but all opinions here are my own. Thank you for supporting the companies and products that make An Affair from the Heart possible. Fall is one of my favorite times of the year. There are many things I enjoy about it – but one of the best things about fall? It’s tailgate season! Whether we are cheering on our favorite teams from the sofa, or grilling up some food in the parking lot before the big game, football is a whole lot about the FOOD! We have some of our tailgate favorites that I go back to year after year, but I try to make something new each game, too. Depending on what time the game is, and what the weather is like, I change up the menu. These little bites of yumminess fit the bill for this weekend’s game perfectly! I made up a batch this weekend for snacking, and made extras that I froze to take to tailgate this weekend. This recipe only uses 4 ingredients. Farmland Bacon, Farmland Smoked Sausage, pineapple and brown sugar. 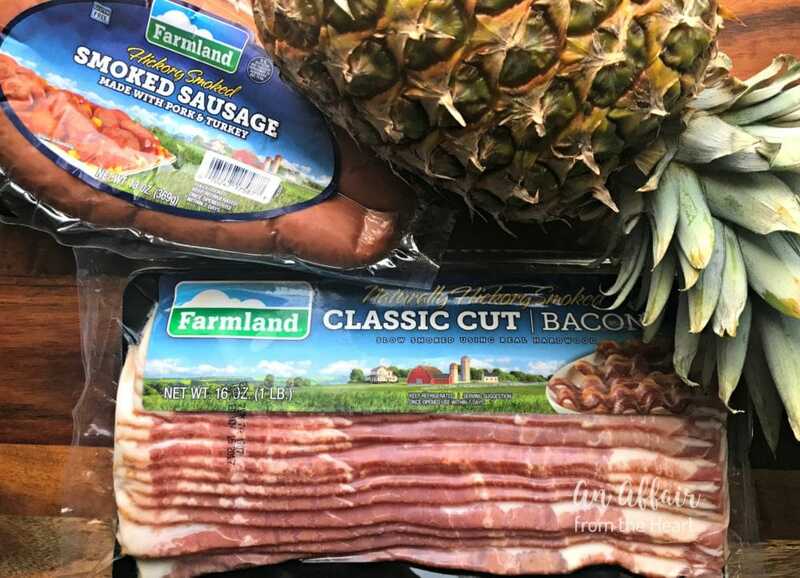 Farmland’s great tasting products – bacon, sausage, specialty cut ham, and more – are tender, flavorful, and made right here in the USA with quality ingredients. All Farmland products are free of hormones and MSG. Farmland, is a leading brand of bacon, sausage, and ham, and is proud to partner with the National FFA Organization, formerly known as Future Farmers of America, to support the future of agriculture. With every Farmland item purchased now through September 30, 2017, Farmland will donate $0.10 to FFA, up to $75,000. These donations will help FFA continue to further its mission of making a positive difference in the lives of students and shine a light on the agricultural industry. In addition to the donation, Farmland will provide grants to select Midwestern FFA chapters later this year, providing financial support to high school students working on animal care projects. Participating products include everything from Farmland bacon and breakfast sausage to boneless ham and lunch meats. For more information on Farmland, and how to donate, please visit FarmlandFoods.com. Support the Future Farmers of America by going to Hy-Vee or your local grocery and purchasing Farmland products now through Sept. 30, 2017. 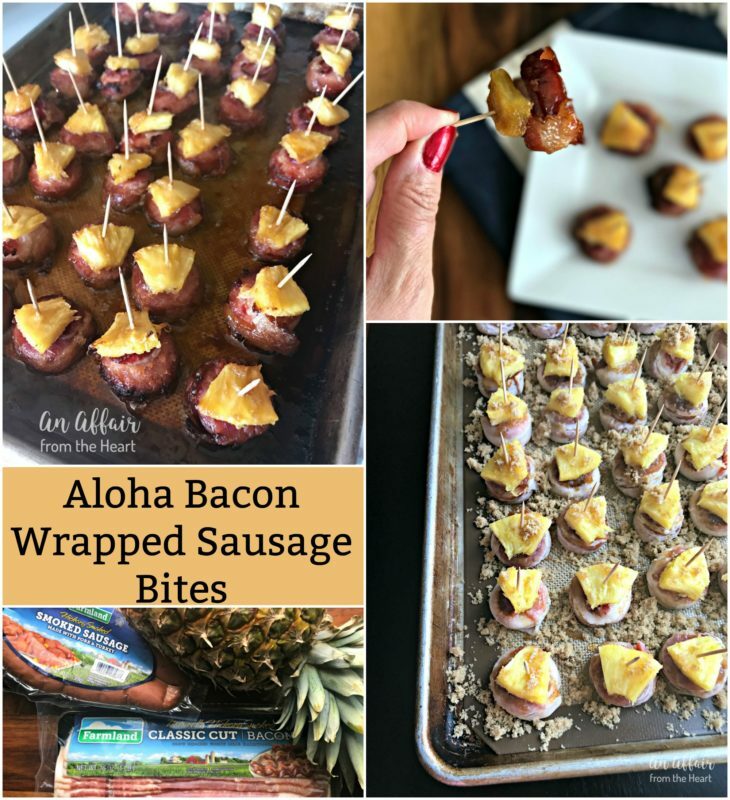 These Aloha Bacon Wrapped Sausage Bites would be a great way to help out and make your tummy oh so happy! Slice the Farmland Smoked Sausage into bite sized pieces, and each piece of bacon into thirds. Stand a sausage bite on it’s side and wrap the bacon around the edge, pulling it tightly, then pressing it around the top and bottom to secure it. 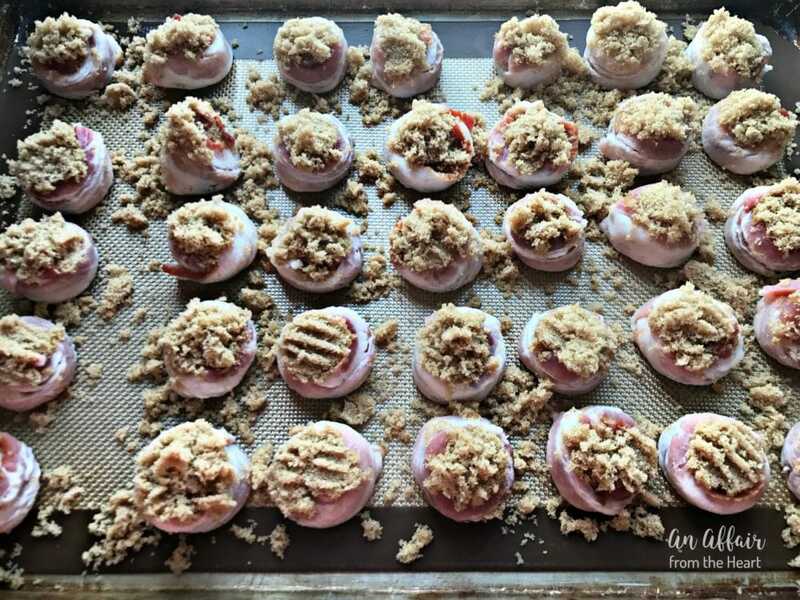 Place each wrapped bite on a cookie sheet, lined with a Silpat mat or foil. Sprinkle generously with brown sugar. 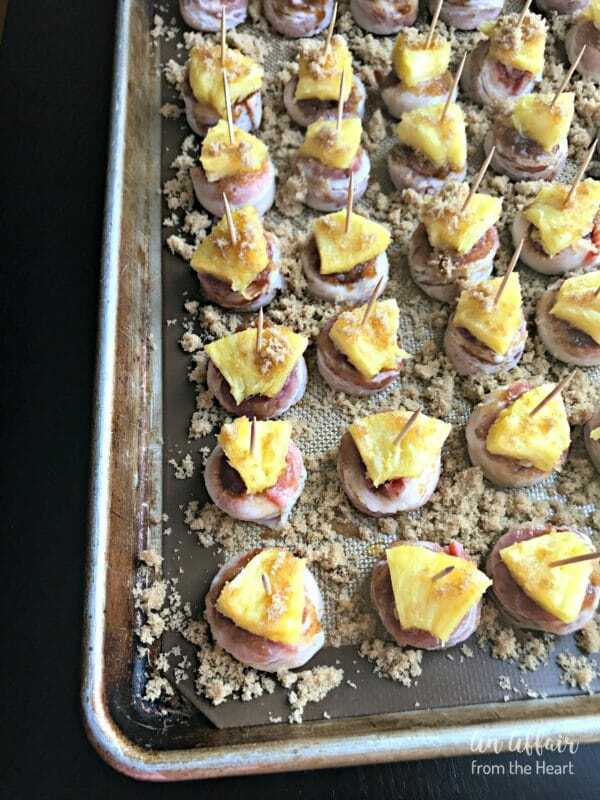 Top each bite with a piece of fresh pineapple, secure it with a toothpick, and give it a light dusting of brown sugar. 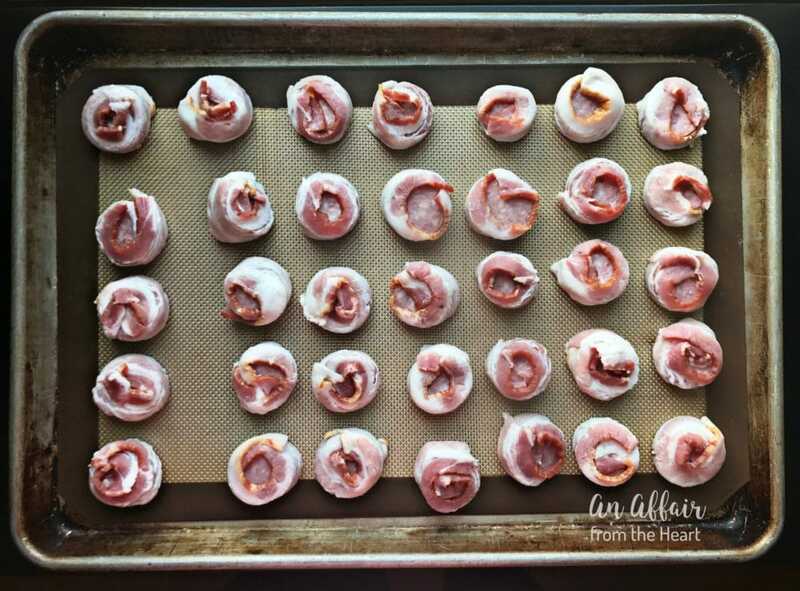 Bake them for 30-40 minutes, or until bacon is done. Serve warm. I made up an extra batch to take to tailgate. I put them in a foil wrapped pan, and froze them. I will take them along in the cooler, and reheat them on the grill before the game. I hope that you will take this opportunity to help out the National FFA Organization by purchasing Farmland products this month! 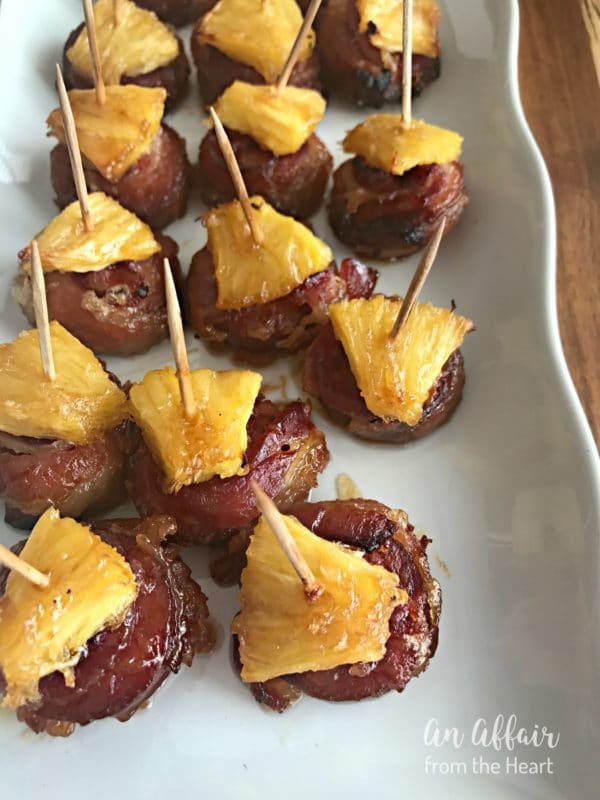 Bite sized pieces of sausage, wrapped in bacon, topped with fresh pineapple and brown sugar - baked into a perfect little appetizer that just begs to be eaten. Preheat oven to 400 degrees and line a cookie sheet with a Silpat mat or foil. 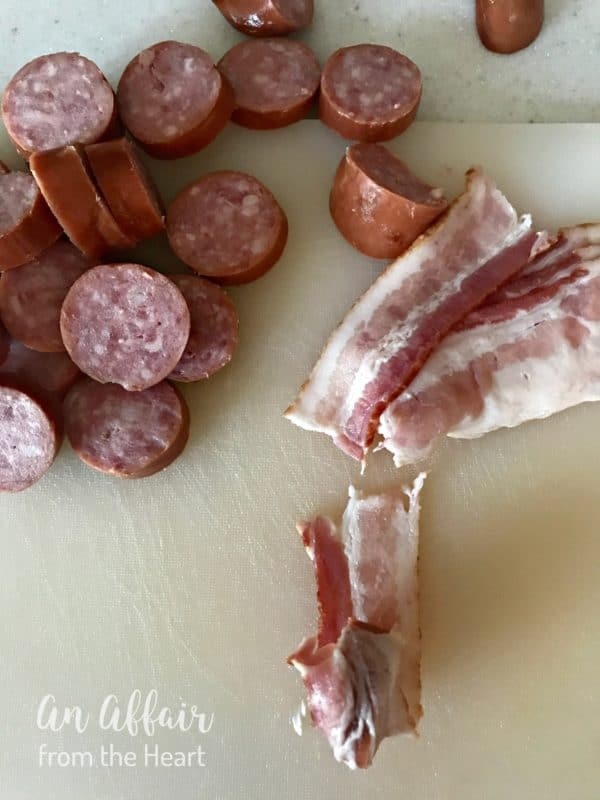 Sliced sausage into bite sized pieces. Cut bacon into thirds. Slice and cut pineapple into bite sized pieces. Wrap the outside of the sausage with bacon and press around the edges to secure. Place on the cookie sheet. 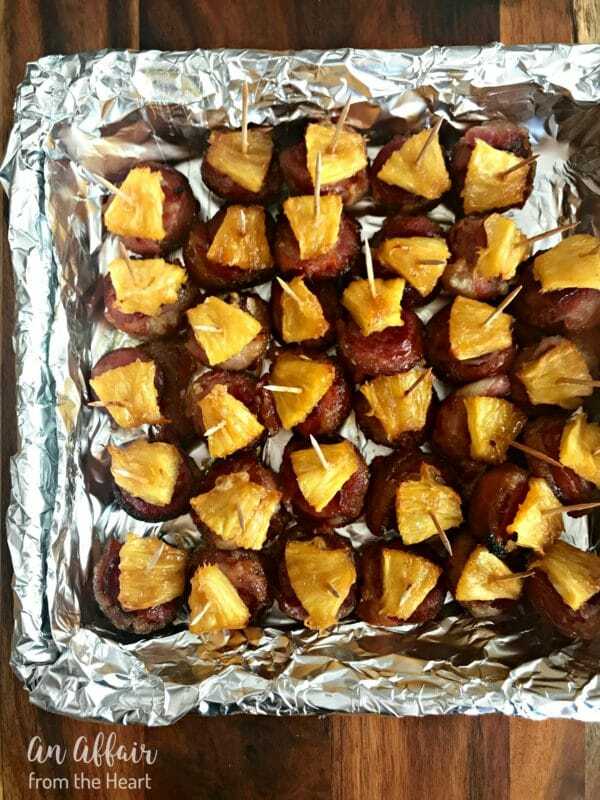 Secure a piece of pineapple to the top of each sausage bite with a toothpick. Give them a light sprinkling of brown sugar. Bake for 30-40 minutes. Watch closely for bacon to be cooked. Definitely making these over the weekend! Perfect football watching snacks! Oh my! I would so love these!! Sweet, Spicy and Salty! I have won me over! Yum! I’m adding this to my holiday appetizer recipe ideas. These are just the perfect size for fun little appetizer bites – just right for tailgating and football parties! And so easy, too! That’s always a big plus for me! I love the combination of sweet and savory… these little bites are the perfect way to deliver big flavor to a crowd! Yum! And always happy to support FFA! Oh my goodness do these ever look tasty. The combination of flavours would be amazing. Have to give this a try. Thank you for the recipe idea! I love this time of year too and Farmland products. This appetizer looks amazing and would be perfect for tailgating! This is so perfect for game day!! I love this recipe idea! This is literally THE PERFECT appetizer!!!!! Sweet, salty, savory, ALL THE THINGS I LOVE!!!!!!! 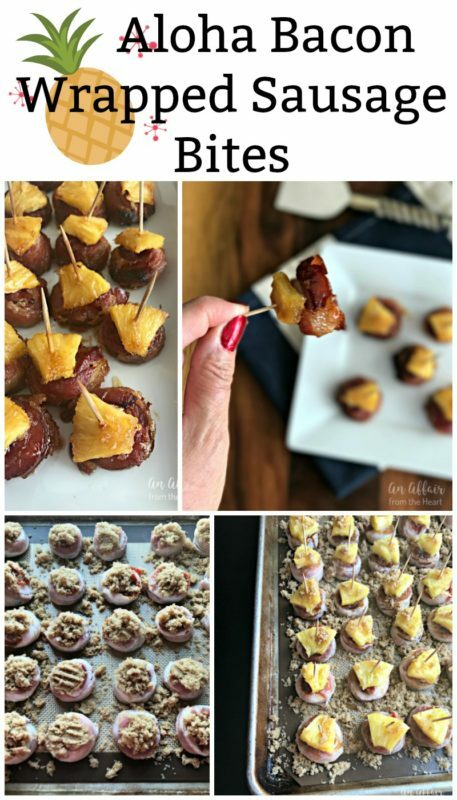 These sausage bites sound amazing! 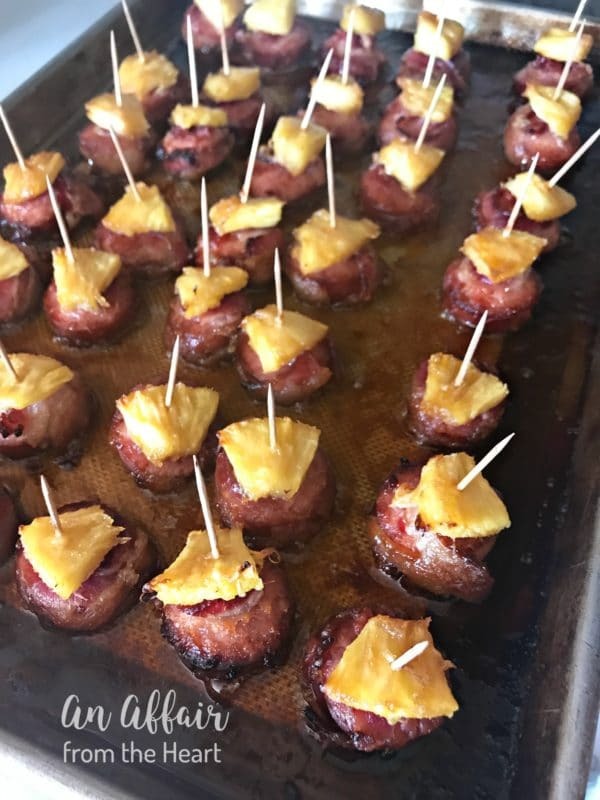 I know they would last for about a hot minute in my house, we all love anything involving sausage and bacon! Our whole family will go crazy for this idea. We use Farmland bacon all the time in our house so can’t wait to give your delicious recipe a try! Thanks so much for sharing this one. We hope you all enjoy them! Ooh, these look sooo yummy! 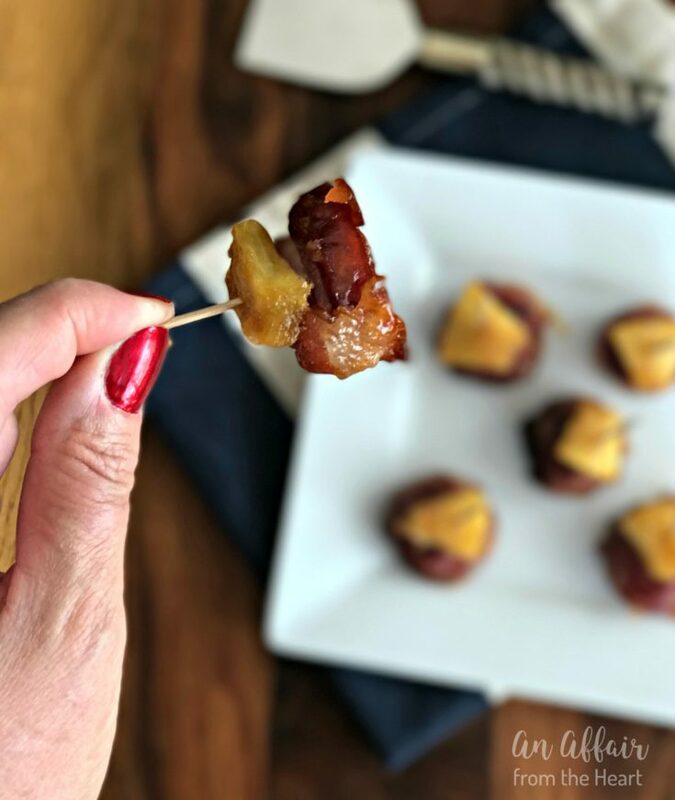 Tailgating is alla bout easy bites and finger food and this totally nails it – I love all that caramelization!! I love all these flavors but my favorite thing is that you can make a TON of them and they are easy to serve and even easier to eat! This is such an awesome appetizer idea! I can’t wait to make these for game day!